My urban fantasy shapeshifter story, "Out of the Light," has been reprinted in issue #2 of Black Infinity. The theme for this issue was "Blobs, Globs, Slime, and Spores." Check out the great retro cover at the right. "Out of the Light" first appeared in Dark Wisdom Magazine (#11) in 2007. It was nominated for an Aurora Award, but as I had another story on the ballot that year, I asked for it to be removed from the ballot so I wouldn't compete with myself. 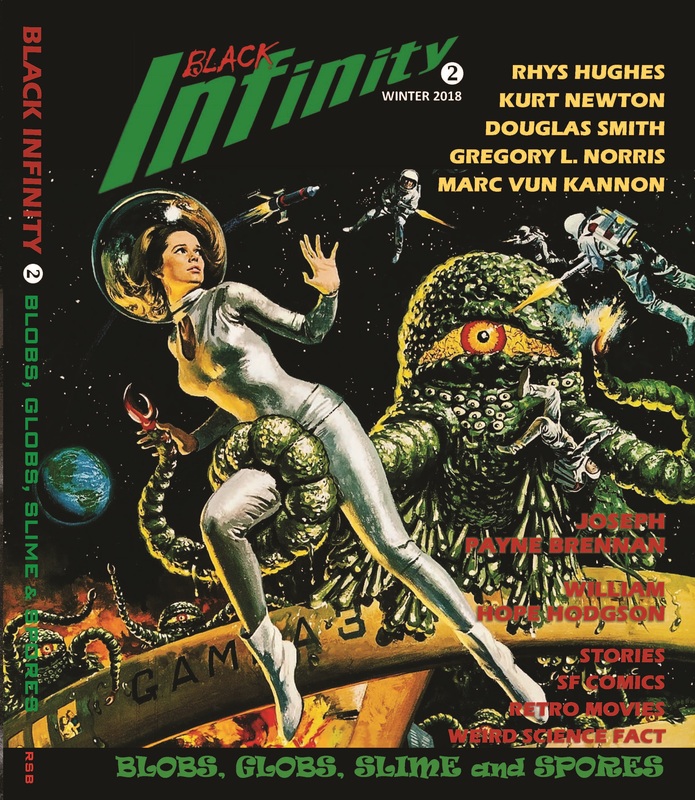 Black Infinity #2 features 13 tales of blobs, globs, slime, and spores, plus a brief history of gunk and goo in SF magazines, movies, TV and comics; not to mention science fact, retro movie reviews and comics. 200 pages of slimy fun, with new stories by Rhys Hughes ("Swallowing the Amazon"), Gregory L. Norris ("The Tree Surgeon") and Marc Vun Kannon ("Boarding Party"). Plus Douglas Smith's "Out of the Light" and Kurt Newton's "The Old Mill." I also had a story in the debut issue and will have a story in issue #3 as well, which will be the first time I've been published in three consecutive issues of any magazine. Very cool.